Information are taken off Ansuz website. The more powerful equipment, the harder mechanical parts in a HIFI unit work, and mechanical motion will always result in noise and vibration. With a new and innovative construction principle ensures DARKZ Decouplers to lead noise and vibration effectively away from the speakers and other HIFI devices - the effect of DARKZ can be both heard and felt. DARKZ Decouplers comes in 3 different versions, Aluminium, Ceramics and diamond - each with strong individual qualities. HIFI enthusiasts know the term, "Black is the foundation ..." - get is about creating the right environment for wonderful HIFI sound experience. 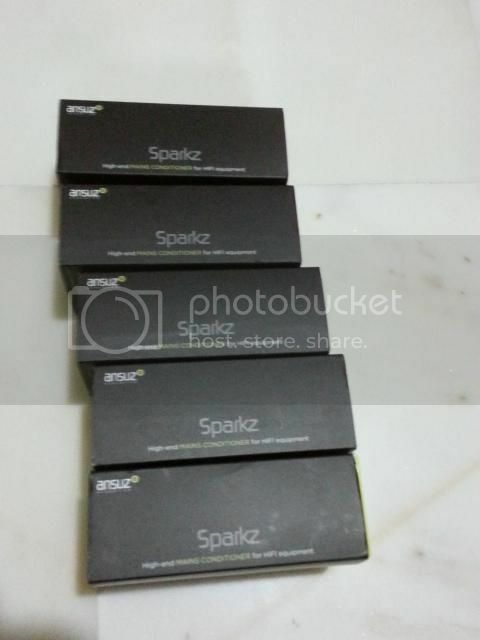 SPARKZ Sound Enhancer are based on a simple technology, but will contribute with something quite special to your HIFI environment. All 5 in Liao ah? Lucky no more outlet to plug it in. Great poh piah session with my brolers followed by music at home...this is life! Haha yup me cheapo plug in plug out can hear difference ard.....cant imagine with 5! In case anyone wondering... the sparkz are here. Collected mine oredi together with a few brolers. my kit chan 左右手合音 become very obvious now! ...hands still trembling from the kum cheng in the music. PK jor. Paid too much for the raidhos. Wow! Sparkz in your love life Heh! ... Seriously, why too much for the Raidhos? These sparkz are really like a m203 round. Music becomes AoE! Broler B3 asked me to confirm the effect of plugging Sparkz in the same TV circuit tomorrow with the VT50.